Who is going to have the best year between Blake Griffin, DeMar DeRozan or Kevin Love? The Open Floor podcast discusses that and more. Kevin Love, DeMar DeRozan and Blake Griffin are all settling into new situations. Love signed a contract extension with the Cavaliers for four-years, $120 million. DeMar DeRozan was shipped to San Antonio in a deal that involved Kawhi Leonard. 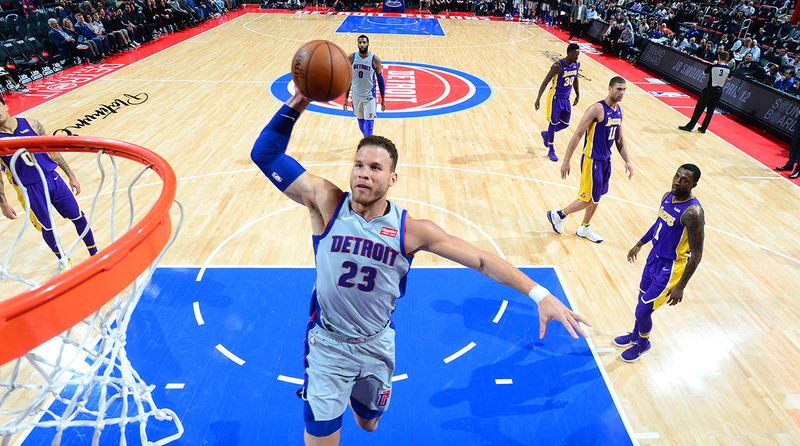 Blake Griffin will get a fresh start with the Pistons under new head coach Dwane Casey. The Open Floor podcast crew breakdown what they expect from each player and predict who will have the best season among them. Andrew Sharp: Who is going to have the better year this upcoming season: Blake Griffin, DeMar DeRozan or Kevin Love in Cleveland? Ben, what do you think? Ben Golliver: This is such a bleak question (laughs). Just take the cities. Imagine if you are a big-time All-Star level player—where do you want to live and enjoy your career: Cleveland, Detroit or San Antonio? It’s like 'Okay, well how do I arrive at the process of elimination to arrive at the one that will be the least painful.' I think the safest money right now will be on DeMar. In terms of health he has the fewest red flags. Obviously Blake Griffin has a long history of medical issues but I think Kevin Love in the immediate aftermath of that new contract, I didn’t think nearly enough people were talking about his list of health issues he has had. To commit that much money to him given those issues would have made me think twice, think three times, think four times, hang up the phone, think five times. I think DeMar is probably set up the best for success but still I don’t love the fit there in San Antonio—I think they are going to be working through a lot offensively. I was reading a piece by James Herbert at CBS Sports which made a great point about the Spurs—they have lost a lot of perimeter defense between Kawhi Leonard, Danny Green and you can also throw in Kyle Anderson as well and DeMar is just not that guy on the wing. I think their league-leading defense status in recent years is definitely going to be put to the test next season. I don’t love any of these situations but I think San Antonio will have the most wins out of those three teams. I think DeMar has the least health risk and I think Pop will be creative and utilize him and understand what he can and cannot do and coaxing him to play more efficiently. I am talking myself into DeMar, even though that is very, very painful. Sharp: It kind of depends on how you define success. A better year statistically, I think I will go with Blake and he will probably make an All-Star game and DeMar DeRozan won’t. That is one thing we didn’t explain on the Kawhi emergency podcast. For DeMar DeRozan, to make the All-Star Game in the West you have to basically be All-NBA caliber. Even Chris Paul didn’t make the All-Star game last season and it is going to be really tough for DeMar. I think the Spurs are going to win somewhere near 47 to 52 games—if that’s how you define success then maybe DeMar wins this battle. The Love thing is really interesting though I had the same exact reaction to his contract because I saw that he re-signed in Cleveland and I started to think about the fantasy numbers that he is going to be putting up next season. The obvious takeaway is to say all right—Love is going stay there and put up 25 and 15 for the next 8 months. He is probably going to win 35 games but he is going to be happy getting his numbers. But then I did start to wonder... we haven’t seen Kevin Love with that many extended stretches of health since he has been in Cleveland and I think that will be a huge concern for the Cavs. I also wonder if the Cavs did this with the intent of trying to trade him next summer which is much harder to read. That is pure speculation on our part but that is the one way you can read this and say that it was a smart move and say we got Kevin Love locked up and as teams go into next summer looking for stars and they strike out, Love will be a pretty attractive trade asset. Golliver: First on Blake: he hasn’t played 70 games since 2014 in a season. If we had gone back five years ago we would have certainly bet he’d be a top-10 player now and he is nowhere near that conversation so I look forward to next season. He might sneak into the All-Star Game if he can stay healthy early on but are we going to view his season as a success given his inability to stay healthy and on the court. Sharp: What we are doing with Blake is that we are due for at least one more great Blake Griffin season and I think it is going to come next season before things start to unravel while he is getting paid like $45 million a year while only playing 50 games a year. Everyone understands that the backend of that contract is going to get dark. Blake is so talented and the East is already kind of watered down at this point. He’s got to have at least one year because it’s too depressing to think of the alternative.